Following the successful completion of the initial phase we were appointed Architects for Phase Two. This comprises the restoration and alteration of three existing attached properties, two which were unoccupied and in a considerably poor condition, resulting in an emergency stabilisation contract being undertaken. Due to the neglected condition, internal timber and plasterwork were beyond repair, however new timber sash and case windows and shopfronts were manufactured using astragal sections taken from existing windows within the buildings. An inappropriate rear extension was removed together with damaging cementitious render. This allowed stone indenting and repointing in lime to take place prior to the application of traditional lime harling of external walls. Reforming of the roofscape was achieved by the re-use of second hand scotch slates and restored cast iron rooflights on softwood sarking, supported on roof timbers constructed to existing pattern – all joiner made on site. This roof area includes traditional cat slide dormers and stone chimneys rebuilt based on historical information with lead works incorporated. Existing cast iron rainwater conductors were overhauled and dry rot repairs carried out to existing timber floor joists. 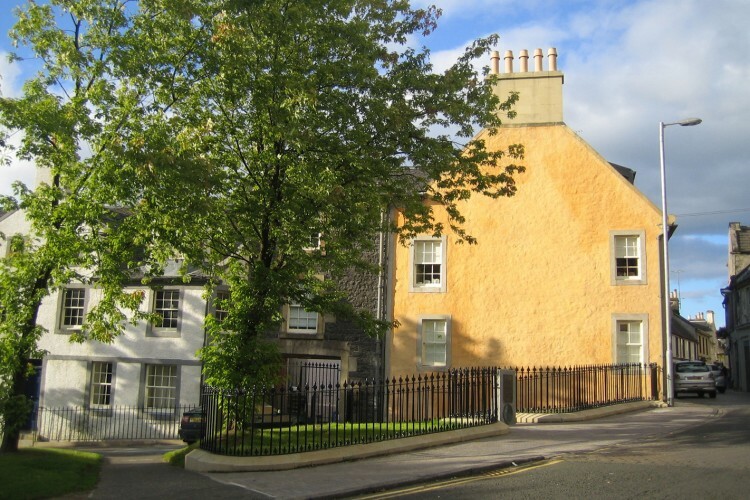 The work was grant aided by Historic Scotland and the Heritage Lottery Fund.